Denna produkt ger dig 1947 bonuspoäng. 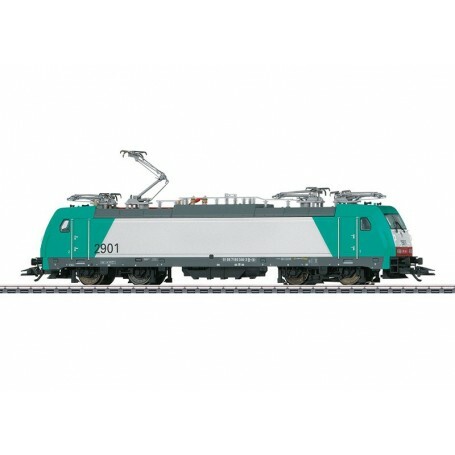 Ellok klass E 186 'Alpha Trains' typ SNCB, loket har mfx+ digitaldekoder med ljudmodul och högeffektsdrivning, längd över buffertar 21,7 cm, epok VI. Class 29 Electric Locomotive	Model: The locomotive has an mfx digital decoder and extensive sound functions. It also has a special motor, centrally mounted. 4 axles powered through cardan shafts. Traction tires. The triple headlights and dual red marker lights change over with the direction of travel, will work in conventional operation, and can be controlled digitally. The headlights at Locomotive Ends 2 and 1 can be turned off separately in digital operation. When the headlights at both ends of the locomotive are turned off, then there is a double 'A' light function at both ends. Warm white and red LEDs are used for the lighting. The locomotive has 4 mechanically working pantographs that are not wired to take power. Length over the buffers 21.7 cm / 8-1/2'. Prototype: Alpha Trains NV/SA, Antwerp, Belgium class E 186 general-purpose electric locomotive, leased as the class 29 to the Belgium State Railways (SNCB). Two-system locomotive with 4 pantographs. Locomotive includes a wide variety of light and sound functions. mfx decoder included.